Needle aponeurotomy (NA), also known as needle aponevrotomy and needle fasciotomy, was developed in Paris, France, by Dr. Lermusiaux in the 1970s. 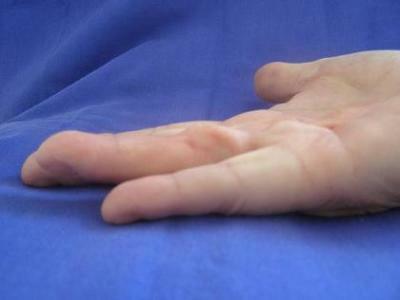 The French technique involves perforating and transecting the fibrous bands of Dupuytren's using a small hypodermic needle. Once these cords are weakened, the procedure is completed by extending the effected digit and completely severing the Dupuytren's cords. NA is a minimally invasive, low cost office procedure requiring only local anesthesia. NA has been used in France for over 30 years and is now available to you in the United States. NA is an outpatient office procedure requiring less than one hour to complete. -NA is a low cost procedure. It is considerably less expensive than surgery. It does not require hospitalization or general anesthesia. -NA is very safe. NA has virtually no complications or scarring. -NA has a short recovery period. Most activities may be resumed after two days. Extensive physical therapy and rehabilitation are not required.